From every media source we are challenged to find a way of living that will ensure the longevity and health of our environmental, economic, and social resources. We all want to do our part, but the plethora of information about “green” living, “green” technologies and “green” architecture can be overwhelming. Lucky for those of us with historic Florida homes, our houses were built with many environmentally friendly assets that help us reduce energy consumption. 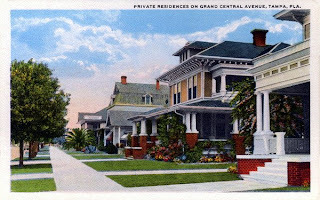 Prior to the introduction of air conditioning, Florida builders used techniques that “green” designers are now advocating, such as deep covered porches and wide eaves, window awnings and shutters, and operable windows. While we Floridians may not be willing to turn off our air conditioners in August, these features do allow us to make the most of Florida’s more temperate seasons while reducing our energy consumption. 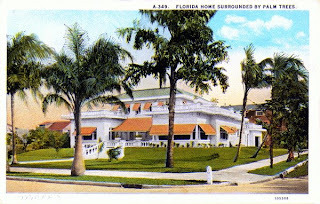 Front and rear porches served dual heat-related purposes for Florida homeowners prior to the introduction of air conditioning. First, they sheltered the main building from the harsh sun, reducing heat gain and protecting interior furnishings from fading. In addition, porches provided an escape from the sweltering heat inside the home, providing a sheltered space to sit out of the sun while enjoying cooling breezes. A series of techniques were used in conjunction with windows and doors to increase cooling effects. Awnings were historically used to protect windows from direct sunlight thus helping to keep interior rooms cool. Popular from 1870 to 1930, fabric awnings were made of canvas attached to a fixed or retractable metal frame and came in several colors and patterns to accent the home’s architecture. Metal awnings and Bahama shutters were common beginning in the 1940s and original versions are still seen shading many homes. Windows in older homes were usually operable to allow cooling breezes to enter the home. They were almost always covered with full-height screens to prevent pesky mosquito invasions. Screen doors were also installed on all exterior doors, again allowing breezes to enter the home without inviting bugs. Doors typically had covered overhangs when not already sheltered by a porch, protecting entrants from rain as well as sheltering the house from the sun. In many early homes, sleeping porches were constructed for relief on hot summer nights. Usually located on an upper floor, these rooms typically either had rows of casement windows or screened openings to capture as much air movement as possible. As the name implies, rows of cots were set out to provide easier sleeping conditions during hot nights. These are only a few of the methods typically utilized in older homes that are still effective today. We have become so reliant on air conditioning and heating that we sometimes forget to take advantage of the inherent good design found in our historic homes. As the weather gets more pleasant this fall, consider taking a few steps to operate your historic house more energy efficiently, and save some money in the process.